Pastel lizards inspired by Deep Space Sparkle. This lesson was more complex than some of my students were used to. (If you haven’t signed up for the Deep Space Sparkle Teaching Art 101, Please do!) We started by drawing the shape of our lizard using familiar prompts like: Draw a backwards ‘C’ to make your lizards face. My younger students found drawing the legs the hardest part and I would recommend taking extra time to help them with the concept of not drawing stick legs. All of my students had trouble NOT adding detail to this picture as they loved drawing spots and stripes on the lizard. The trick is trying to get them to colour their lizard in first before adding the details. 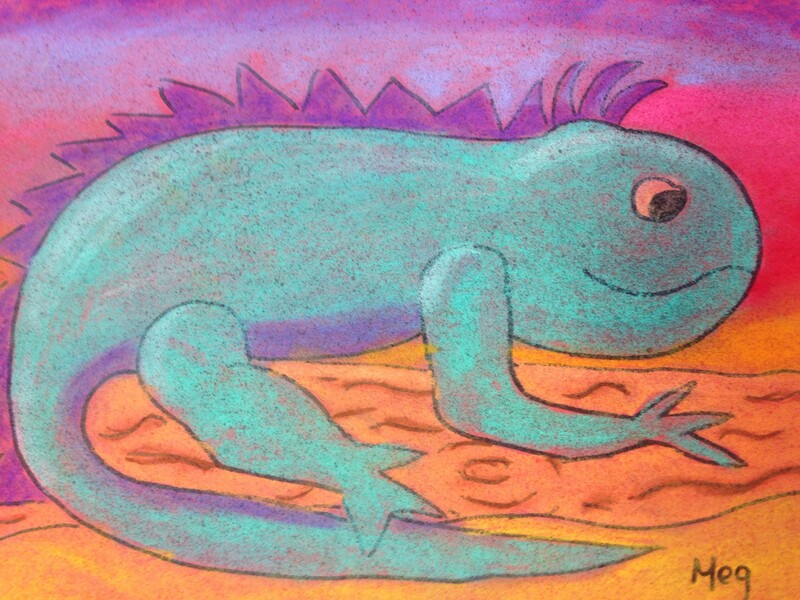 We used chalk pastel to colour our lizards which allowed for great mixing and blending of colours. I changed the lesson somewhat as our instructions called for black pastel to be used for the outline. I couldn’t find a pack of solid black oil pastels so we used Sharpie markers instead. This made nice clean lines, however, before you can add detail or redo the outline you need to spray the artwork with the workable fixative or your sharpie will get gunked up with chalk. I had both a professional fixative and tried a cheap hairspray and there was no comparison. The hairspray caused the chalk to clump and the paper to curl.